Marshmallows are surprisingly easy to make and beats the store bought ones as far as flavor and texture go. They wrap up nicely and store for up to 2 weeks in an air tight container. They make a pretty and tasty gift! Line a 13 x 9 inch pan with foil and grease with cooking spray. In a large bowl combine the gelatin with 1/2 cup water, set aside. In a large sauce pan combine the sugar, corn syrup, salt and remaining water. Bring to a boil while stirring occasionally. Allow to continue to boil without stirring until a candy thermometer reads 240 degrees. Remove from the heat and add to the bowl of gelatin. Beat on high for approximately 15 minutes until mixture is thick and it has doubled in volume. Add in peppermint extract and beat until combined. Spread mixture into prepared baking dish and cover. Allow to stand at room temperature for at least 6 hours. Lift the foil out of the pan to remove the marshmallows. Coat a sharp knife with cooking spray and cut into squares (however small or large you like them). 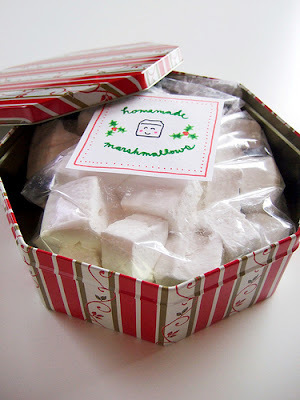 Dip marshmallows into desired topping or press into confectioners sugar. Store in an airtight container for up to 2 weeks. Yum, these sound amazing! Definitely pinning this!